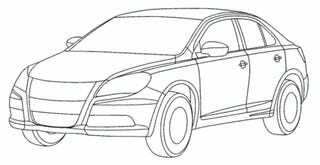 Grab your crayons, kids: Outlines of the 2010 Suzuki Kizashi have been leaked from the sieve-like European Trademark Office. The end result looks like the Suzuki Kizashi 3 concept after engineering dropped it in the dryer and put it on the "Sonata, Malibu, 1-Series Cycle." This is a pretty weak leak, considering we don't know what the lights, wheels, and grille really look like, but combined with news about the Kizashi's engines last week, we practically know everything there is to know about the car. You can color in the rest between the lines.